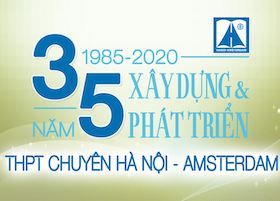 [Vietnamese Teachers' Day -20/11] Mrs. Trinh Thi Huyen-the ferryman on the river named 'history'. This 20/11/2014 is the 32nd anniversary of the Vietnamese Teachers’ Day (1982-2014) and it is also the third 20/11 that she is the form teacher of our class 12-History. Mrs. Huyền is not only our form teacher but she is also our teacher of History so regardless of her maternal leave or her poor health, Mrs Huyền has always been the closest to us. Her lessons are always full of love, national pride, arousing our love for the nation. Mrs Huyền taught us a famous saying: "If you fire at the past from a pistol, the future will shoot back from the cannon." She also teaches us that, in order to understand history, we need to learn the source of the problem and the source of history. The quotes and the examples that Mrs. Huyền uses make the lessons more interesting and help us to understand more about the history ways of thinking and makes us to love the subject, the subject that keeps the traditions of our ancestors. Most specially, although Mrs Huyền always keeps a strict attitude, she is really committed to the class and the students. She always spends time checking up on the class to understand what the students think and need. We still remember that during the training for the National Team, although you were expecting a baby, you still stood by and supported us. The image of you climbing four staircases to teach us will never fade in our mind as it showed your care to us, your little students. Perhaps, our first impression on you was your strict attitude. Not every teacher spends the first meeting to talk about rules in the classroom, something that we will forever remember as they go with the mistakes that we have made and all the lessons you have taught us. You taught us to face up to our mistakes, take the responsibilities so that we can be better people . Mrs. Huyền believes that teaching is traininghumans, therefore, she always says that her greatest happiness is to see her students grow up and be capable of dealing with problems in life. Maybe, there were times when sheand the class went through difficult situations, however, she is always the light guiding us through our failures, leading us to successes. Maybe, no article could express all the love that she has given to us, but we hope that this could be our dearest thank to her from her beloved class 12-History.